CHANDLER, Ariz. – Feb. 14, 2018 – Bob Bondurant School of High Performance Driving, is celebrating its official 50th Anniversary today. After the horrific crash where Bob’s McLaren steering arm broke on Turn 4 at Watkins Glen in 1967 that ended his illustrious racing career, Bob Bondurant chased his dream of opening a school that would empower other drivers with the skills needed to master car control. Bob opened the doors of his school on Feb. 14, 1968, in Orange County, California, with five vehicles and three students. Since that time, Bob Bondurant’s school has become a world-class driver training facility that annually brings in over $40 million in revenue to the Greater Phoenix-area. Over the last 50 years, the school has grown in both size and reach. From 1968 to 1990, the school was hosted at various racetracks in California, before relocating to its permanent home at the Wild Horse Pass, Motorsports Park in Chandler, Arizona. The school is considered to be “the world’s fastest 100 acres” and boasts a fleet of more than 200 vehicles. To date, the school has trained the Bondurant method to over 500,000 students from around the world, including many celebrities from the entertainment and sports industries such as Tom Cruise, Clint Eastwood, 50 Cent, Van Halen, Slash, Sean White, Jimmy Johnson, and Jeff Gordon to name a few. 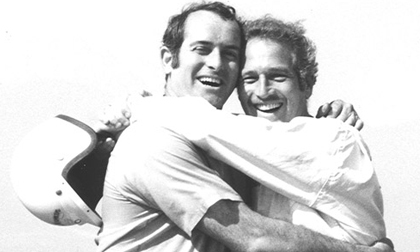 Hollywood actor, Paul Newman, was one of the first three students to train with Bob Bondurant in 1968, for the movie, “Winning”. Bob and Paul forged an unbreakable bond of friendship as Bob continued to coach Newman through movie roles and two decades of racing at LeMans and winning SCCA championships. Bondurant has secured some of the most globally recognized names in automotive industry. Datson, Porsche, Ford, GM, Chevrolet, Dodge FCA, Fiat, Goodyear, SHELL, Pennzoil, Borla, and Eiboch, etc. To give everyone a chance to celebrate its 50th Anniversary, Bob Bondurant School of High Performance Driving, is offering a 50 percent discount on all of its classes that are registered only today between 8AM and 5PM MST. In order to take advantage of this 50th Anniversary promotion, guests are asked to call (480) 403-7600 and ask for their 50th Anniversary discount. The Bob Bondurant School of High Performance Driving and Bondurant Racing School, which is located in Chandler, Arizona, is the only purpose-built driver training facility of its kind in the World. At the heart of the 100-acre facility is The Bondurant Companies that includes Bob Bondurant School of High Performance Driving, Bondurant Racing School, Bondurant Race Series, Bondurant Trackside, Bondurant SuperKarts, and Bondurant Drag Racing School. The school maintains over 200 race-prepared vehicles, sedans, SUVs and open wheel cars for programs that instruct teenagers, car enthusiasts, military, and racecar drivers. For more information, visit www.Bondurant.com or call (800) 842-RACE.